Evi Beast - Koï sind drei Musikerinnen und eine Videokünstlerin, die Improvisation, Experimentierfreude und Interaktion mit Bild und Ton vereinen. Sie kreieren ein Universum, wo visuelle Objekte als Klangtexturen zu hören sind und Musik als bewegende Bilder sichtbar wird, inspiriert durch einen japanischen Karpfen, den Koï; farbenfroh, gesellig, anspruchsvoll, stimmungsvoll. Visual artist, video director and performer, Delphine's research and experimentations are focused on exploring the question of theatricality in projected image. Most of her work is conceived in close relation with sound artists. 2009-2011 ____Université de Genève, IUFE, Maitrise universitaire spécialisée en enseignement secondaire. 2006-2008 ____Haute Ecole d’Art et Design, Genève, Certificat de formation pour l'enseignement, TRANS. 2003-2008 ____Haute Ecole d’Art et Design, Genève, Diplôme HES HEA en Arts Visuels avec mention. 2000-2003 ____Université Montpellier III, Montpellier, France, DEUG et Licence Arts Plastiques. 23.11.2014 ____Continuous Albedo, concert/performance audiovisuelle, Nu Things, Osaka, Jp. 14.11.2014 ____ Aral, performance audiovisuelle, Tokyo Experimental Festival, TokyoWonderSite, Tokyo, Jp. 21.03.2014 ____ Aral, performance audiovisuelle, Eikon, Fribourg, Ch. 28.02 2014 ____ Aral, performance audiovisuelle, Nu Things, Osaka, Jp. 27.02 2014 ____ Aral, performance audiovisuelle, UrbanGuild, Kyoto, Jp. 23.02 2014 ____ Aral, performance audiovisuelle, Palais des Paris, Takasaki, Jp. 14.12.2013 ____ Atticq Drôïna, installation et performance audiovisuelle, l'Oblo, Lausanne, Ch. 05.12.2013 ____ Atticq Drôïna, installation et performance audiovisuelle, Auditorium, Musée d’art moderne et contemporain, Strasbourg, Fr. 18.10.2013 ____ Beyond the wall - Atelier Verrière Sud, Group exhibition, performance audiovisuelle, Fonderie Kugler, Genève, Ch. 06.04 2013 ____ L'hypothèse de la continuité, performance audiovisuelle, Espace Kugler, Genève, Ch. 22.03 2013 ____ Equinoxe with INSUb 5tet, Depres/d'incise/Bondi/Loubatière/Ortis/Läng, performance audiovisuelle, ouverture de résidence, Espace Kugler, Genève, Ch. 26.10.2012 ____ Meteôros v.V, audiovisual performance with d'incise from residency at klangkunstprojekte, Leipzig, De. 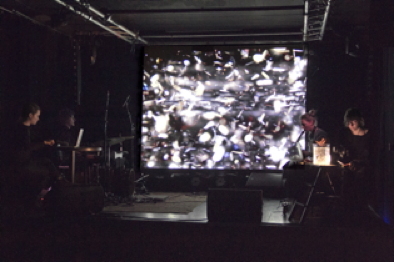 24.10.2012 ____ Aral, performance audiovisuelle, FEED soundspace, Berlin, De. 26.05.2012 ____ Aral, performance audiovisuelle, Espace Rien, Genève, Ch. 10.03.2012 ____ ABS6 for CENC, performance audiovisuelle, Usine Kugler, Genève, Ch. 25.02.2012 ____ laloutre, Nippon decadance, Blackmovie, Zoo/Usine, Genève, Ch. 29.01.2012 ____ Aral, Fourth OrKoli Festival at Zimmer, performance live audiovisuelle, Tel Aviv, Is. is an electronic musician working on sound design, electronic compositions, and experimental improvisation with her laptop. After a background in classical and jazz studies (she graduated in piano performance+composition&arrangement), Coralie took a bigger interest in experimental and electronic music. Her work is now focused on mixing electronic sounds and field recordings to create compositions with various arranged and impromptus parts, development of personal textures, with many influences stemming from improvisation in contemporary art. She has been studying electronic experimental music with laptop virtuosos Ikue Mori, Chuck Bettis, and Dafna Naphtali in New York. She has been performing with other experimental musicians including a duo with laptop musician Chuck Bettis, and the bands “Silver Process”, “Crying Acor”, “Yokai”, “4tet Weiss/Loriot/Costa/Lonfat”, a.o. She is currently performing with the bands "INKlings" (Weiss/Voser/Lonfat), "EVI BEAST-Koï", "Spook" (Jhabvala/Frey/Lonfat), and the Insubmetaorchestra (founded by Cyril Bondi & d'incise). geboren in Südafrika, Saxofonstudium am Berklee College of Music in Boston bei Andy McGhee, an der Zürcher Hochschule der Künste bei Christoph Grab und Nathanael Su, Fagottstudium an der Musikhochschule Luzern bei Stefan Buri. Sie spielte u.a. neuere italienische Volksmusik mit dem Orchestrina Ludiziana von Franco Ghigini, alte Schweizer Lieder neu interpretiert im Projekt Art & Weise von Dide Marfurt und Dodo Hug, Renaissancemusik auf alten Instrumenten wie Schalmei, Pommer, Dulzian, Krummhorn, Gemshorn mit I Corteggiani von Christoph Peter, Westafrikanische Musik mit dem Perkussions-Ensemble Schlagart von Markus Maggiori mit Famoudou Konate, Daniel Pezzotti, Willi Kotoun, Roman Glaser, Südafrikanische Musik mit dem Trio Sumithram mit Lionel Sumithram und Chris Jaeger Brown sowie in verschiedenen klassischen Orchestern, Jazzformationen und experimentellen Musikprojekten.